SACRAMENTO (Scrap Monster): The proposed state-wide ban on plastic bags by California is less likely to go into effect on July 1, 2015. The bill signed by Governor Jerry Brown on 30th September this year in currently on hold until a referendum on ballot which is scheduled to take place during November 2016. The opponents of the ban are reported to have obtained more than enough signatures within the deadline which came to an end on Dec 29th. SB270 was approved by the State Assembly in its second attempt by a 44-29 vote on August 28th. The bill in the first voting was rejected by a 37-33 vote, after falling short of supermajority by 4 votes. The bill was then headed back to the Senate for a concurrence vote. Upon Senate’s approval, it had been pending before the Governor for final signature. The bill had faced strong opposition from the plastic and paper bag industry. The plastic bag industry has been opposing the bill from the beginning citing that this will lead to large number of job losses. 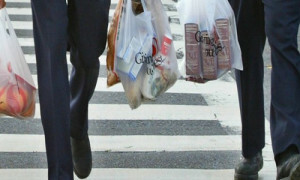 The paper bag industry had raised strong campaign against levying 10 cents fee on reusable checkout bags. How will Asian polymer markets open the new year?